Well, I know the whole world is a buzzed with news of Prince William’s engagement to get married…or maybe not. However, the story of the young man who stood up to the TSA by first refusing the full X-Ray screening and then the full pat down has put him up against the ginormous National Security Agency and the Transportation Security Agency. He did not want them touching his jewels to make sure he did not have anything explosive attached there. He secretly hid a cell phone and recorded his whole interaction with the TSA agents. He blogged about it and now he is being interviewed internationally by major outlets about his junk and civil rights. It has brought up questions about privacy and how much security measures are needed to secure our airports. 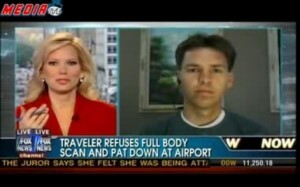 I personally think the TSA agents need to get more money for having to touch the junk of guys like John Tyner. I mean, I wouldn’t, Al Quaeda or not. Although there may be some validity to the privacy issue that Tyner makes, he is no Rosa Parker on this issue as some have asserted. I prefer that we take measures to secure our airways. However, we need to find better and less intrusive ways to do it. We also need to find ways to get better arrival and departure times and stop letting national security be the excuse for poor customer service and mistreatment of air travelers. We also have to make sure that we have the best personnel working at the airports. Now granted none of us like strangers taking pictures of or touching our junk ( well most of us, at least) but hopefully Tyner’s episode will spur discussion on better ways to secure air travel. Now Mr. Tyner, rest assured that no one soon will touch your junk…well , maybe your doctor and your wife.